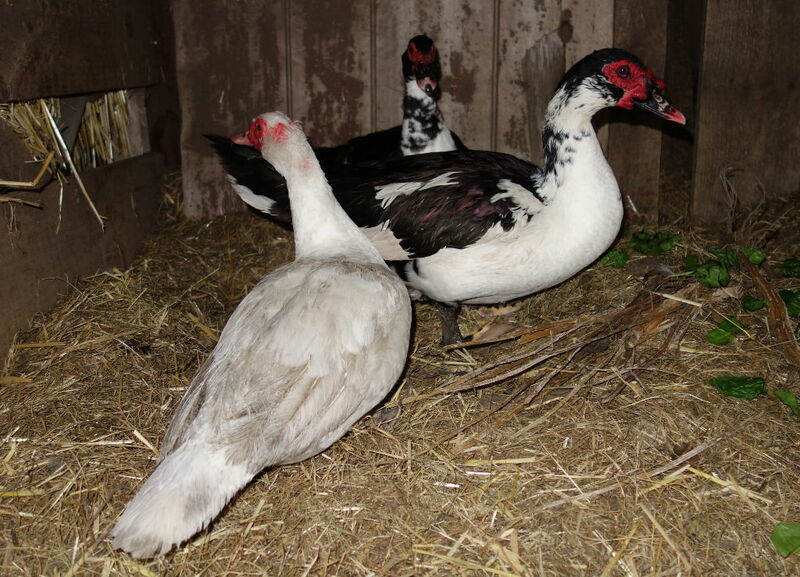 Back in 2016, we decided to get some Muscovy ducks. We obtained a drake and two females in exchange for a few peafowl in desperate need of re-homing (they were crapping on our roof and scratching up the car), and shortly thereafter purchased two more females from a nice bloke in the Huon Producers Network. We fenced off an area around a handy shed up near the big dam, the idea being we could let them have access to the dam from there, but could also easily lock them up if need be. Muscovys aren’t into water as much as you might expect for ducks; I mean, they need it for drinking and bathing, but they’re (mostly) not perpetually swimming; you can get away with a few large trays of water (replaced daily!) if you need to keep them in, as you do for a week or so when moving them to a new home, or when locking them up because a couple of months after moving in they suddenly produce ducklings that you realise you want to protect from potential predators. 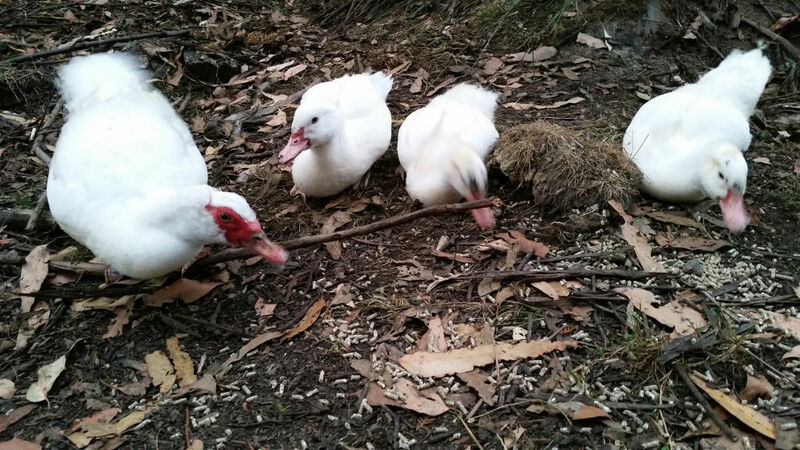 When we let the five original ducks out, they spent a lot of time browsing at grass and finding bugs and things. They also dig these little divots in the ground, especially in areas where you’ve tipped out a tray of water. I’ve taken to calling these divots “duck holes”. Eventually they found their way down to the dam and had a swim. Turns out they love the weed that grows in the dam, too. So we’d let them out in the morning, then lock them up again at night. If they were down by the dam when it was time to lock them up, they’d generally follow us back for food, all except one, a duck we named Crazy Eyes. She really loved that dam, and many times just wouldn’t follow us back to duckland. If we tried to grab her, she’d just go swim out on the dam again. She spent about a week out there one time, before finally deciding she wanted some of the delicious duck pellets we were peddling. 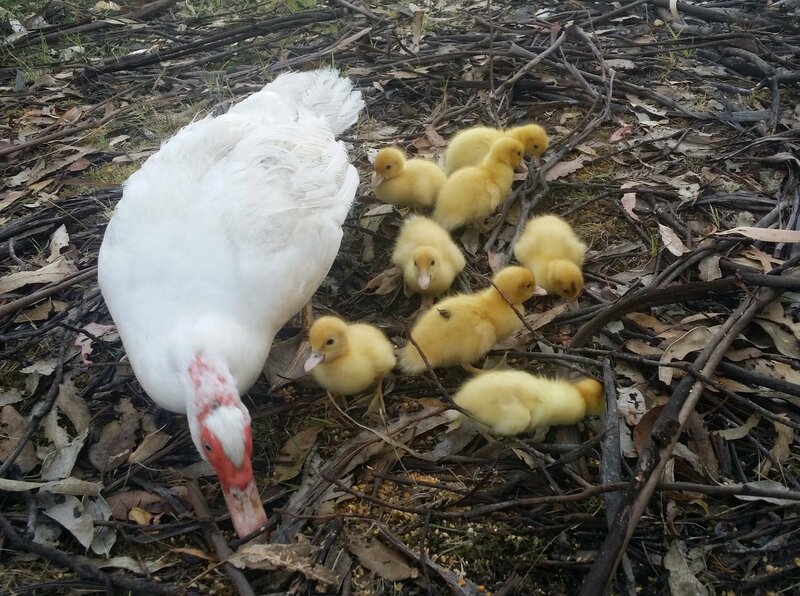 When the first set of unbelievably cute ducklings appeared, we stopped letting everyone out during the day for fear of hawks, wedgies, kookaburras and such. What we hadn’t counted on was the big bloody bush rats that had set up home in a network of tunnels under the duck shed. One day there were eight ducklings, the next day seven; of course we thought we’d miscounted. But when there were only four the day after, we realised the problem. 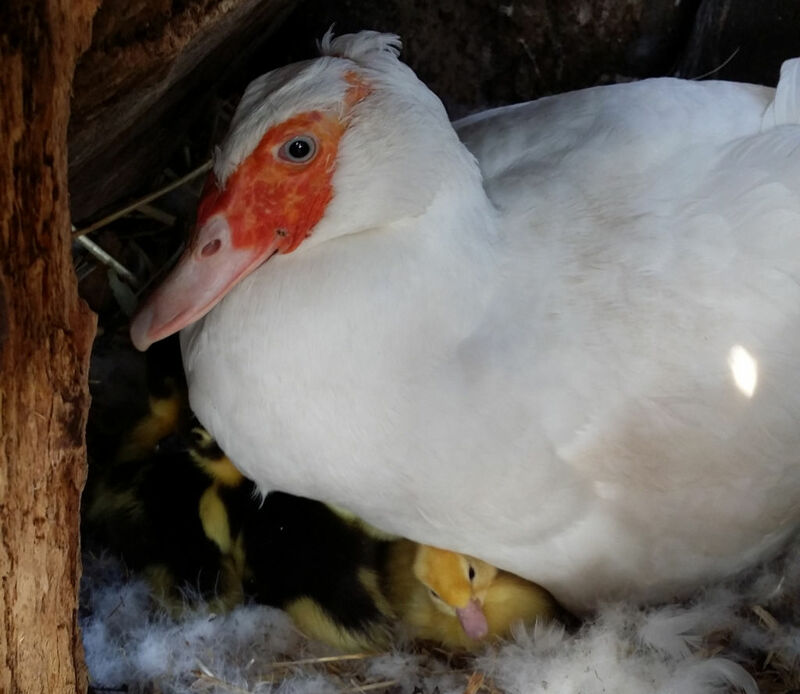 So we caught that mother duck and her ducklets and brought them down to a vacant chicken enclosure near our house, kept them there until the young’uns were bigger than the rats, then took them back up to duckland. We did the same thing again a while later, with the next mother duck. Flash forwards a few more months and there were about twenty-five ducks in residence. 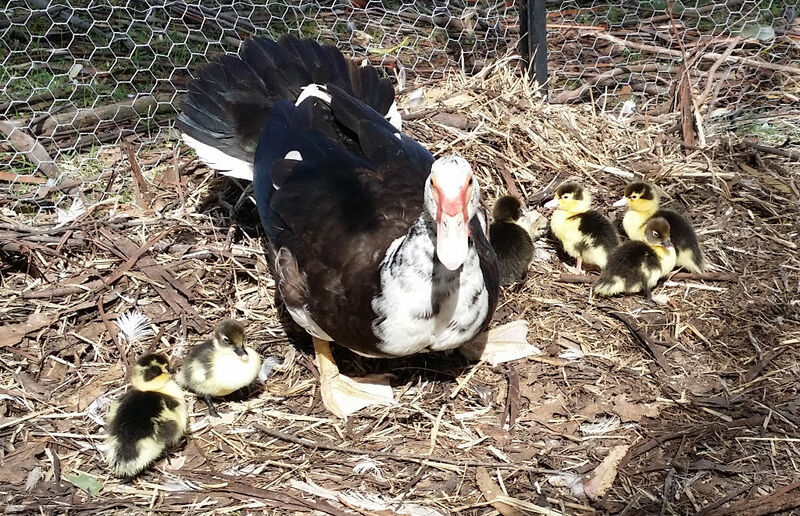 To solve the rat problem – and also the problem of giant eucalypt branches falling into the duck enclosure and trashing the netting – we decided to move the ducks down to live by the bulrush dam. 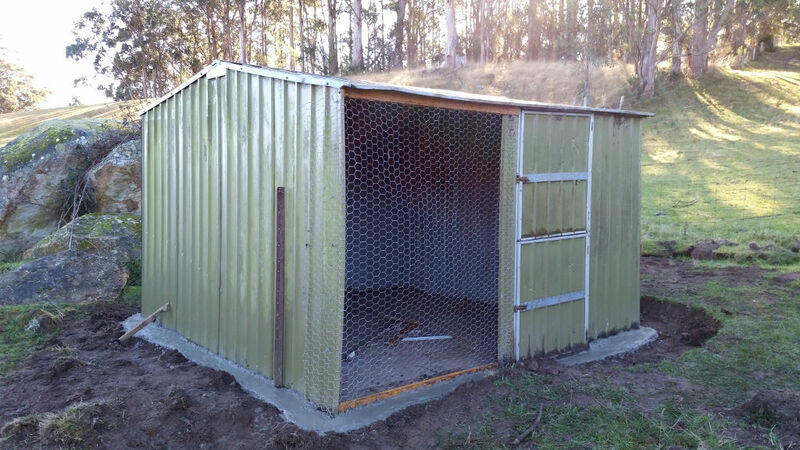 Conveniently, there was a 3m x 3m tin shed sitting unused in the middle of the forested part of the property, so we tore that down and reassembled it next to the bulrush dam. We concreted in around the edges of the shed to avoid rats tunneling under, and reused the star pickets, fencing wire and what netting we could from the old enclosure to make a new yard. Then we locked the ducks in there for a week so they’d learn that this was where they lived now. 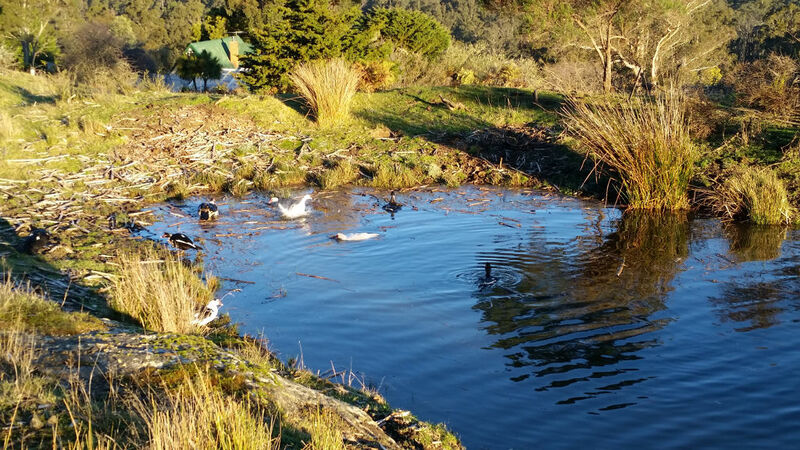 The ducks seemed to approve of their new home. 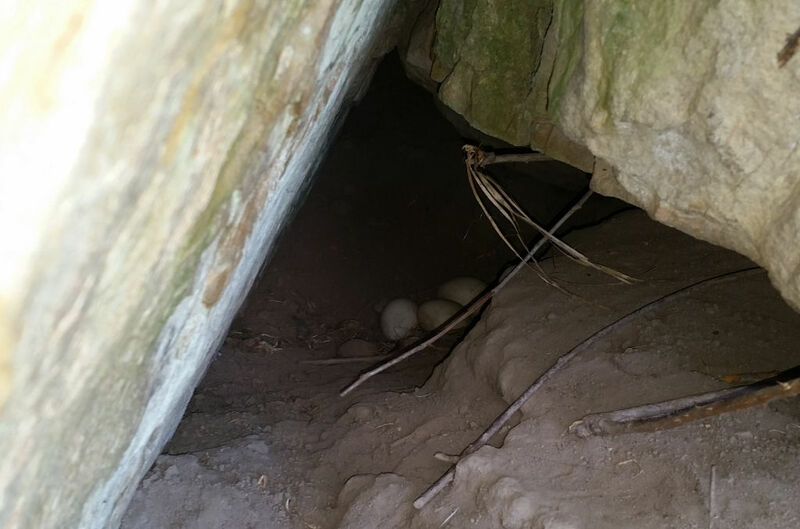 They drank and paddled in the little spring that feeds the dam, swam on the dam, and laid eggs in difficult-to-reach places under some large boulders. Then one day, quite a while later, we were feeding the ducks, and there was no Crazy Eyes. The next day, we discovered her back up on the big dam, 250 metres away. So I led her back down with some food, and she was happy to come, but I have to say that 250 metres is a very long, slow walk when you’re being followed by a duck who’s content to also walk, rather than fly. For a while after that, she’d spend some time at the bulrush dam, and some time up at the big dam as she saw fit, but then later she vanished entirely. We hadn’t seen her for at least a week or two, when suddenly one evening at about 8:00pm I discovered her in the shed opposite our house, tearing apart a straw bale and “bathing” in a little ceramic pot of water. Horrified by the carnage inflicted on our nice straw bales I gave her some food. And she kept coming back – each day between 8:00-8:30pm, Crazy Eyes would suddenly appear and start destroying the straw again in search of food. So one night I decided to lie in wait then follow her to see where she went, so we could find out where exactly she was living. I can’t remember how long the stakeout lasted, but it must have been at least thirty to forty-five minutes before Crazy Eyes was done eating food, done destroying straw bales, and decided to head off up the hill. I followed at a discreet distance of five to ten metres, so that she’d hopefully think I was on a completely unrelated walk and wasn’t paying too much attention to her. Then, when she crested the ridge to the south of the big dam, I lost her. There’s so much underbrush in that area, and she’d managed to get into it before I got to the ridge myself, so I couldn’t tell exactly where she’d gone, and it was getting dark. I tried various paths around the area and checked the old duck shed, but to no avail. Eventually I gave up and returned to the house. When Morgan asked what I’d been up to, I could only answer “I’ve just been outsmarted by a duck”. Then, one day in mid-January, Morgan was up the back and found Crazy Eyes and eight little ducklings by the big dam. Crazy Eyes had obviously decided to set up a nest somewhere up there (we still don’t know where), then laid a bunch of eggs and diligently sat on them, with trips down to visit our house every evening for sustenance. Within about two weeks, three of the ducklings had vanished (predators? illness?) but we had no way to know what had happened. Then one morning while feeding them, two of the remaining ducklings looked a bit less interested in their food than the others did. We saw them again that afternoon, and those two were obviously unwell – sitting down, uninterested in food, and one was weirdly floppy, for lack of a better description. We brought them down to the house, put them in a cage in a warm room with food and water, but by the next morning they were both dead. Morgan did some research online and found that those symptoms could be indicative of lead poisoning. The dam is almost at the lowest level we’ve ever seen it thanks to minimal rainfall, with shallow squishy marshy bits around the edge. Could there be some lead shot up there from years ago that is now uncovered and being nibbled at? Anyway, the best we could think to do was feed them well twice a day so that if the problem was due to them eating something dodgy, maybe they’d be less inclined to eat that thing if they’d already been well fed. Now, a month and a half later, Crazy Eyes and her three remaining offspring are all doing well, and they really understand that humans bring food. Each day when we go up there, they’ll be tootling around on the dam, or sitting off to the side, but the instant they see one of us, or even hear one of us from the other side of a rise, they run and/or swim right over then stand at our feet making this joyous hahh-hahh-hahh-hahh-hahh “give me food” panting noise. So, of course, we give them some food, and everybody is happy. 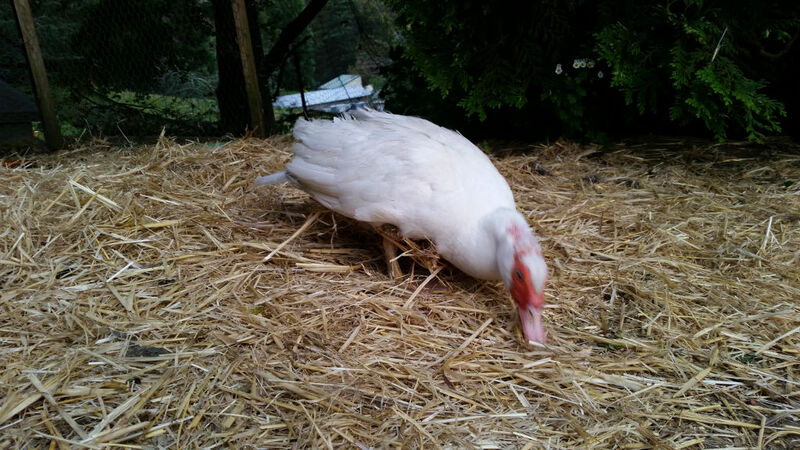 This entry was posted in Uncategorized and tagged Ducks, Poultry by Tim Serong. Bookmark the permalink.